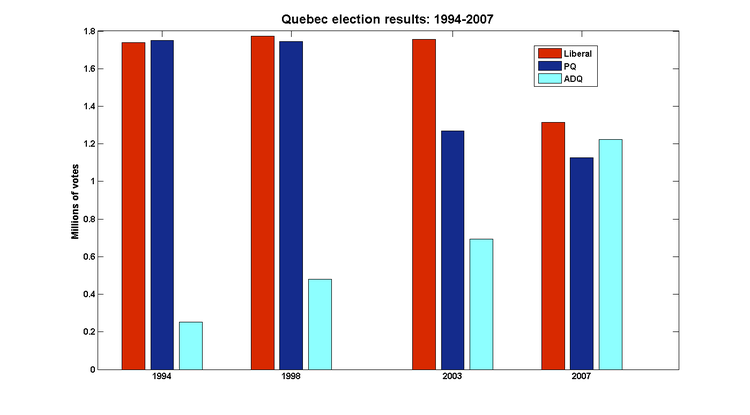 In the last two elections, the ADQ - not the official opposition - picked up votes from the governing parties: first from the PQ, and then from the Liberals. This time around, they won 41 seats out of 125, and finished second in another 40-odd ridings. As one columnist said, the ADQ leader might as well order a set of business cards saying 'Mario Dumont - Premier ministre du Québec'. It won't be long before he'll need them. Update: Here's a very cool electoral map. I suspect that if we ever tried to use it, it would disappear. It seems very likely that - for the tenth consecutive year - the federal government will run a healthy surplus in FY2006-07. For those of a certain age, it is perhaps difficult to believe that large surpluses have become a standard feature of the economic policy background. How did this happen? [I]t shows, in one picture, the seasonal cycle, the business cycle, and the long-term trend in American labor force participation coming from demography and feminism. 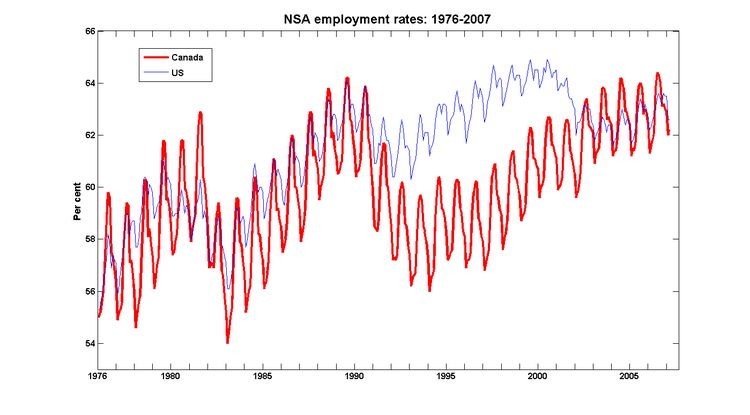 The amplitude of the Canadian seasonal cycle is twice that of the US. Small wonder that the popular X11 seasonal filter was developed by Statistics Canada. Technical change is steadily reducing the importance of the seasonal cycle: the 4-point swings of the 1970s have been cut in half. For example, construction is now a year-round activity here in Quebec City. The slowdown of the early 1990's was exceptionally severe, and we've only just recovered. This no doubt goes some way towards explaining why the mid-90's had such turbulent politics: it was no time to be running for re-election. • low-income families are subsidizing the participation of higher income families. The facts do not support Rae’s and Usher’s tuition fee campaign... [E]conomist Hugh MacKenzie recently examined the issue and found no evidence that low tuition fees result in a net transfer of resources from low-income households to high-income households. As polemics go, it's not particularly compelling: the 'myth' is ascribed to people who are described as 'disgraced' and 'conservative', and it is countered by an unsupported assertion that someone has disproved it elsewhere. University students are twice as likely to come from the top income quartile than from the lowest income quartile - which means that twice as much public money will go to tuition subsidies for students from high-income families. [T]he fact that young people from high-income families are overrepresented in the student population and young people from low-income families are underrepresented does not mean that subsidizing tuition from general government revenues results in poor families subsidizing rich families. One cannot make that claim without knowing the distribution of the taxes levied to provide the subsidies. Referring to chart 5, where an income quartile group’s share of the college and/or university student population is greater than its share of the total income of all families with children, a tuition subsidy paid for from general government revenues amounts to a net income transfer in favour of that group. Where an income quartile group’s share of the college and/or university student population is less than its share of total income, a tuition subsidy paid for from general government revenues amounts to a net income transfer from that group to other groups. The first and second quartile groups (incomes below $56,800) make up a larger proportion of the student population than of family income. Subsidized tuition provides a net transfer in favour of families in the lower half of the income distribution. Families in the third income quartile account for roughly the same share of students and of income. There is essentially no cross-subsidy either in favour of or against families in the third income quartile. The fourth (highest) quartile accounts for a smaller proportion of college and university students than it does of total income, so the highest-income 25 per cent of families in effect subsidizes tuition of the lowest-income half of families, through their contributions to the tax system. 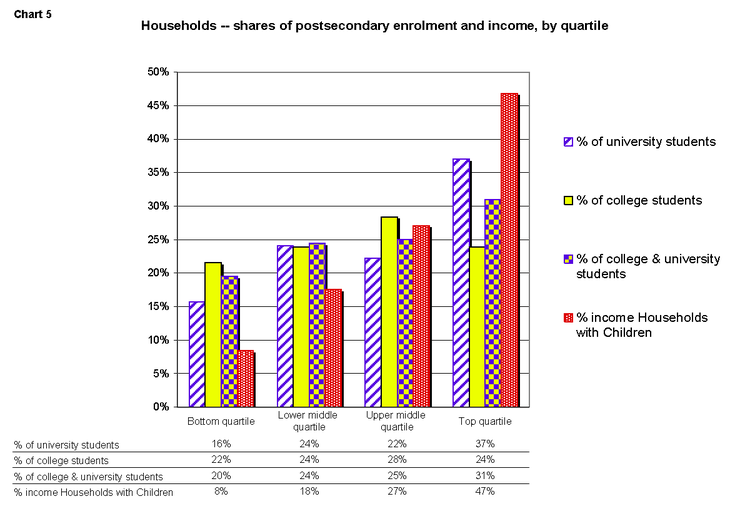 Given the overall pattern, one would expect that families in the top half of the third quartile would be underrepresented among students relative to their share of income, and that families in the bottom half of the third quartile would be overrepresented among students relative to their share of income – producing a rough balance within the quartile. This means that, to the extent that tuition does pose an economic barrier to college and university participation by people from lower-income families, substituting tuition for public funding will tend to reduce the net transfer from higher-income families to lower-income families; replacing tuition with increased public funding will tend to increase the net transfer. More than 60 per cent of families with children are net beneficiaries of the transfer inherent in subsidizing tuition from general government revenues. The claim that subsidized tuition amounts to an unfair, regressive income transfer from poor families to middle- and upper-income families is simply not true. My original point about the regressive nature of the tuition subsidy did not take the tax system into account: I deemed it regressive because it spent more money on students from families with high-incomes than it did on low-income students. To my mind, a progressive system would direct more money to low-income students. The effect of bringing the tax system into the analysis is to greatly lower the progressive bar. In order for a program to conform with this new standard for progressive policies, all you have to do is make sure that the benefits are distributed in a way that is less unequal than the underlying income distribution. This is a remarkably easy test to pass - even George W. Bush's tax cuts satisfy this criterion. Low-Income Kid: "Hey, you guys from high-income families get twice as much public money as we do. Do you think that's fair?" High-Income Kid: "Sure it is - our parents make more than five times as much as yours do." Here I am at ground zero of the Canadian political scene. Politics at the federal level invariably revolves around what's happening in Quebec - and what's happening in Quebec is a provincial election. And in this provincial election, what's happening in the Quebec City area may be determine who wins. And the key to the Quebec City region, the province, and the future of the country may rest in the hands of an anglophone economics professor with an ironically-titled blog. So it is my duty - and apparently my legal right - to tell you my version of what's going on. I'll update this post over the next few weeks. Canada's GDP growth rate fell yet again in 2006Q4. And it's good news! After the big revision in the US numbers for 2006Q4 GDP, Statistics Canada must be feeling pretty good about its policy to not produce preliminary estimates for GDP. If the only drag on growth during 2006Q4 was that inventories were being drawn down, then there's good reason to believe that the economy will bounce back fairly quickly. Canada's current account surplus decreased by $C 5.3b in 2006Q4, thanks to a $C 4.5b deterioration of the income balance. The puzzle about the Canadian income balance is exactly the opposite of the one posed by the US balance. We've been running a healthy current account surplus for 6 years now, and the net international investment position has increased to around -7% of GDP. But an investment balance deficit of $C 5b on an annual basis is something like still something like 1.4% of GDP. In contrast, the US net investment position is a deficit of almost 25% of GDP, and its income balance only went negative a year ago. Even now, the deficit in the US income balance is only one-tenth of one per cent of GDP. There are any number of reasons why the US investment balance defied gravity for so long: Asian central bankers and rich people in politically volatile areas have been happy to buy US assets even if they didn't generate much in the way of return. 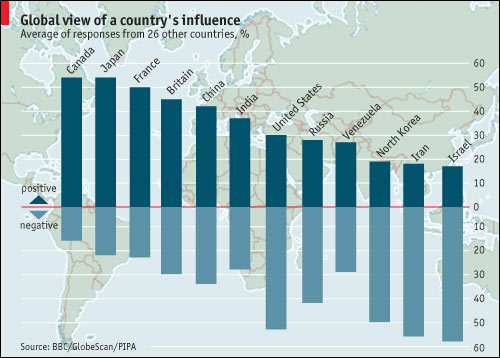 But these reasons don't easily explain why the Canadian investment balance is still so low.